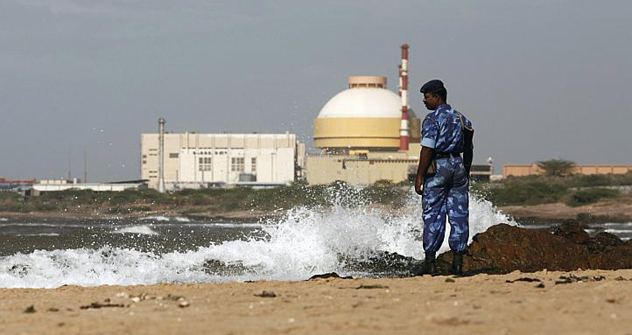 Two petitions have been filed in the Indian Supreme Court against the Russian-operated Kudankulam Nuclear Power Plant. The Russian Government must be watching with bated breath what twists and turns two petitions take in the Indian Supreme Court on the fate of the Russian-built Kudankulam Nuclear Power Plant (KNPP) in Tamil Nadu. The Indian scientific community as well as the government would be equally bothered. Indications are that the Supreme Court won’t be pro-active on a sensitive and vital issue like the KNPP. Already, the apex court has refused to order a stay on the ongoing work at the KNPP site, though legal experts closely associated with the case feel that the court may direct the government to expedite installation of all safety measures on the site. The Indian government has told the Supreme Court that only six of the 17 safety guidelines recommended by the government task force set up after the Fukushima disaster in Japan were in place at KNPP thus far and it will take further period of six months to two years to enforce the remaining guidelines. The Supreme Court started hearing on September 20 a Public Interest Litigation (PIL), which seeks a direction to the Government of India from the court to halt commissioning of the KNPP till all 17 safety regulations recommended by a government task force are implemented. The hearing remained inconclusive after one and a half hours of submissions from Prashant Bhushan, the petitioners’ counsel, and the matter will come up for next hearing on September 27. This itself is an encouraging sign for the well-wishers of the Kudankulam project. It indicates that the Supreme Court is not in a tearing hurry even as the petitioners have thus far secured zero concession from the court in terms of an interim relief or a stay. It was the first of the two PILs that came up for hearing before the Supreme Court on Thursday. The court told the government not to treat the petition seeking the implementation of all the safety steps before the commission of the KNPP as an“adversorial” litigation but as something that concerns the public interest. The court’s observations came when Solicitor General Rohinton Nariman sought to counter Prashant Bhushan as the latter pleaded against the loading of fuel rods in the reactor of the plant till all safety concerns are fully met. As noted before, what the Supreme Court heard today was only the first petition. The second petition is far more ominous and may well put more legal difficulties for Russia for the third and fourth units of KNPP in Tamil Nadu. This petition is even more explosive. What makes it for even more damaging is that a former top bureaucrat of Government of India is among the petitioners. The over 7000-words page fresh petition was filed before the apex court on September 16 and focuses on the issue of Russian liability in case of Kudankulam nuclear plant. It points out that the Indian Government reached an agreement with Russia that in case of any accident at Kudankulam, Russians would not be liable as Indian Government would take all responsibility and financial liability. The petition has been filed by CPIL, Common Cause, Dr. E A S Sarma (former Power Secretary to Government of India) and G Sundarrajan (social activist and lead petitioner in Kudankulam cases). It seeks mainly two directions from the court: (i) production of all agreements India signed with USSR/Russia regarding the setting up of nuclear power plant at Kudankulam; (ii) a declaration that suppliers of the Kudankulam nuclear power plant would be bound by the Civil Liability for Nuclear Damage Act 2010 irrespective of any agreement to the contrary. On December 12, 2011, the Russian Ambassador to India had categorically stated that Russian plants at Kudankulam are not covered by the Liability Act. The petitioners have sought an appropriate writ declaring that the Kudankulam nuclear plant would be governed by the law of the land and the constitutional principles of absolute liability and polluter pays principle. On the other hand, Civil Liability for Nuclear Damage Act 2010 channels the liability of a nuclear accident to the operator (Government undertaking) of the said plant and then limits the same at Rs 1500 crores (about US$ 276 million). Under section 17, it provides that the operator of the plant would have a right to recourse against the supplier (the reactor manufacturer) under certain circumstances. The petitioners’ contention is that though the said Act imposes very minimal liability on the nuclear reactor supplier/manufacturer (putting to grave risk the safety of the power plants) in violation of the ‘polluter pays’ and ‘absolute liability principle’, the Government of India has made Russian company exempt from even this minimal liability also by giving an undertaking to the Russia that Indian public exchequer and the Indian taxpayers would foot the bill in case of an accident and Russians would be indemnified. The said undertaking or agreement has “inherently dangerous implications”, it says. Section 13 of the 2008 agreement between India and Russia states: “The Indian Side and its authorised organisation at any time and at all stages of the construction and operation of the NPP power units to be constructed under the present Agreement shall be the Operator of power units of the NPP at the Kudankulam Site and be fully responsible for any damage both within and outside the territory of the Republic of India caused to any person and property as a result of a nuclear incident occurring at the NPP.” Thus neither is there any liability of the nuclear supplier in case of an accident nor any right to recourse provided to the operator. The petitioners have contended that by limiting the financial liability or by indemnifying the supplier completely the Government of India is facilitating an environment where suppliers would prefer to invest and develop cheaper nuclear reactors rather than safer reactors, thus putting lives and health of millions of people at risk. Their argument is that since the liability cap is much less compared to the cost of a reactor, which is Rs. 30,000 crores (US$ 5.5 billion) or more, it means that cost of installing basic safety features on the reactor may easily exceed the maximum liability amount. Hence this provides a huge incentive to the supplier to take risks with issues of safety. “That is why initially the Russian supplier had agreed to provide seamless reactor for Kudankulam plant, but now has given a reactor with welding and joints. This is the hazard in indemnifying the supplier,” according to the petition. Constitutional expert and former attorney general Soli Sorabjee has gone on record as saying that the accountability and liability in case of an accident at a nuclear power plant was to be solely that of the supplier. Though the last word is yet to be said or written on the issue of large and expensive projects of national importance like the Kudankulam Power Plant, it seems to be quite a long haul for the legal battle. The writer is a New Delhi-based journalist-author and a strategic analyst. His latest book is “Global Jihad: Current Patterns and Future Trends”.